For those of us not too keen on washing up!This belfast sink unit has large cupboard space in which you could put a freestanding dishwasher/fridge/freezer etc, it comes with a full size Belfast sink and chrome mixer tap and is painted in farrow and balls ‘ringwold ground’ (or choose your own colour) this is fitted with contrasting ebonised knobs. 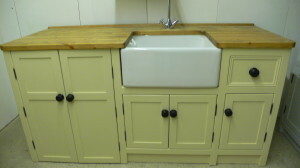 This sink unit with dishwasher cupboard is topped with a 27mm pine worktop that is stained with our antique pine colour then waxed/waterproofed making it durable. this particular unit is 1800mm long but as we make all our units we can make one in your dimensions!